On-demand events can be triggered manually. 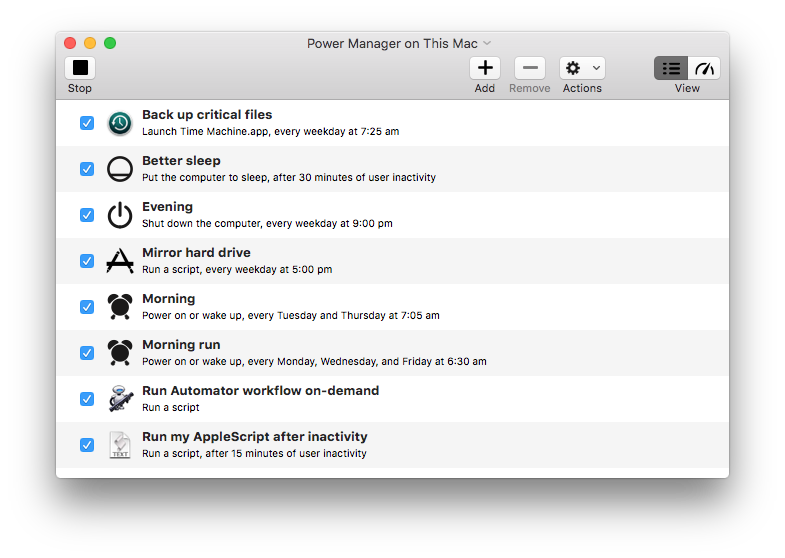 In this recipe we show how to do this using the Power Manager application on macOS. To be able to perform or trigger on-demand, an event needs to have the on-demand behaviour enabled. This is a per-event setting. We walk through enabling and disabling this setting in the recipe How to Add On-Demand Behaviour to an Event. 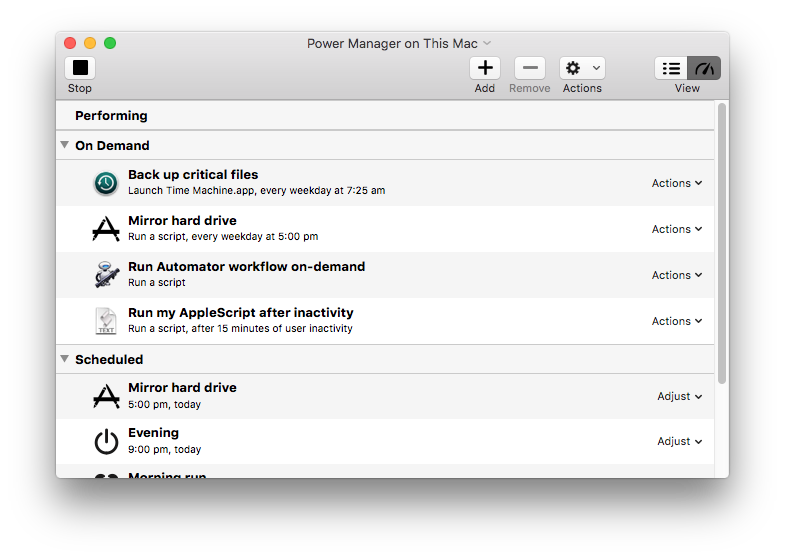 To manually trigger your on-demand event, use the Engine View in the Power Manager application. In the Engine View you will see all your available events; those events that are on-demand and those scheduled for time based triggers. It is possible, and common, to have a single event both be scheduled and available on-demand. Let's step though exactly how to trigger an on-demand event. Having selected Trigger from the Actions pop-up menu, the event will be immediate triggered. This means it will move from the on-demand section while it is being performed and appear in the Performing section. Once the event is able, it will reappear in the On Demand section ready to be triggered again. 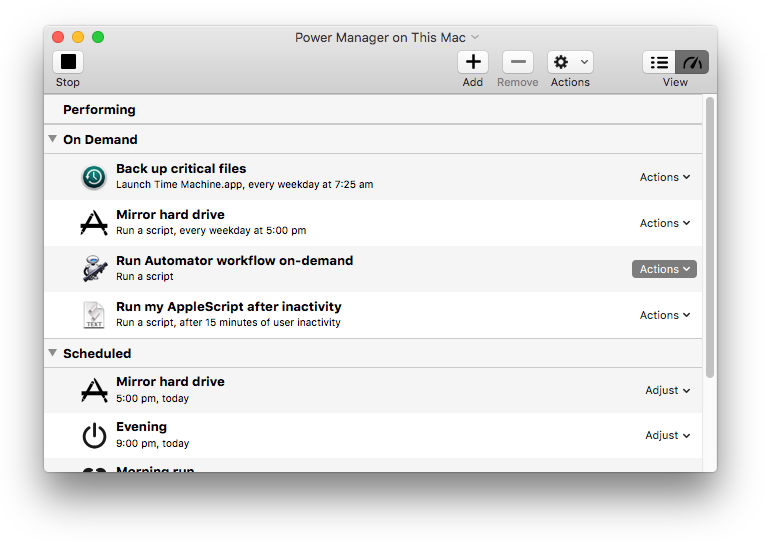 This article was posted in PM4, Power Manager, and Recipe and tagged on-demand, event, and macOS.